Blossom (left) and Minnow out on a walk. Photo: Abbie Hubbard. Blossom with one of her favorite toys. Photo: Abbie Hubbard. Every year, 46 million turkeys are slaughtered for Thanksgiving, and another 200 million throughout the year. Killed at barely four months old and not protected by the Humane Slaughter Act, their lives are short and agonizing. Abbie has witnessed how easily Blossom gets frightened in the safety of her home, whether it’s by the doorbell, loud noises outside or even the soundtrack of a scary movie (This past Halloween, she got spooked when Abbie was watching Poltergeist and hid in the living room. “I turned the film off and went to comfort her,” Abbie says.) 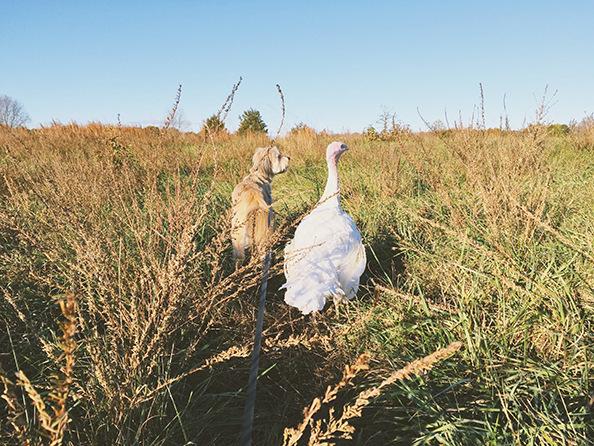 These moments offer a small glimpse into how terrifying daily life must be for turkeys on farms. In fact, it was this fear of danger that led to Blossom being rescued from that West Virginia facility. When the five-week-old turkeys were being moved to a “grow out house” to be fattened up for slaughter, she hid for days behind a piece of equipment. A farm worker who discovered her decided to mercifully surrender her to a local rescue. Minnow and Blossom. 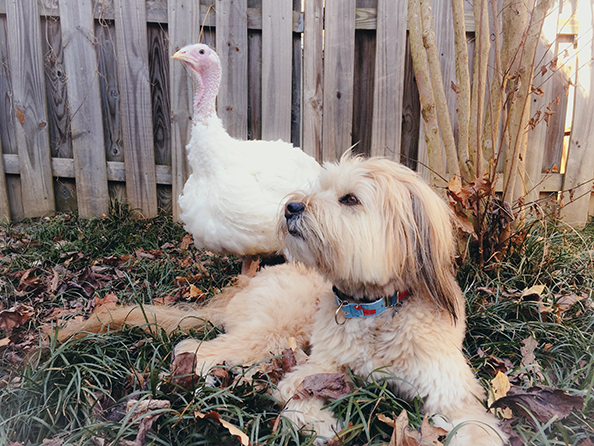 Photo: Abbie Hubbard. There’s no need to uphold traditions that don’t reflect our inherent values of love, compassion and respect. We asked Tere Fox, co-founder and executive chef of the famed NYC restaurant-turned-catering-company Rockin’ Raw, to share the recipes for two of her most beloved dishes. 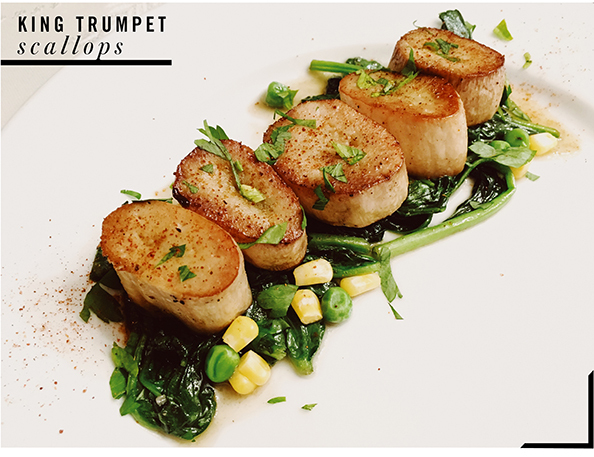 These mouth-watering King Trumpet Vegan Scallops and Heart of Palm Vegan Crab Cakes are festive and unique, and best of all — no one was harmed in the process. 1. Mix the veggie broth with the seaweed and garlic in a bowl, and set aside. 3. Set mushroom pieces in a deep dish or baking pan and pour the veggie broth mixture over them. Let stand for 20-30 minutes. 4. Heat a sauté pan on medium heat, and add 1 tablespoon of sunflower oil or any vegetable oil you have on hand. 5. Place mushrooms neatly into the pan and sear on both sides for 5-8 minutes total. 6. Sprinkle with salt and pepper to taste. Serve with sautéed spinach or fresh greens. If you want to make this a raw dish, soak mushrooms in 2 cups filtered water, 1 large piece of kombu, 1 teaspoon sea salt, 2 teaspoon minced garlic for 3 hours. Then serve over baby arugula or any of your favorite greens. 1. In a bowl, add the chickpeas and heart of palm. Hand mash until slightly chunky and smooth, and set aside. 2. In a mixing bowl, whisk the chickpea liquid until slightly foamy. Then add vegan mayo, lemon juice, tamari, mustard, and all of the herbs and spices. Mix well. 3. Combine the chickpeas and heart of palm mash with the chickpea liquid mix, along with the 2 cups of breadcrumbs, and the scallions into the mixing bowl. 4. Set mixture in the freezer to set for 20-30 minutes. 5. Create a flouring station: 1 cup any plant based milk, 1 cup flour, 2 cups bread crumbs. 6. Remove mixture from freezer, lay parchment paper on a baking sheet and start to bread. 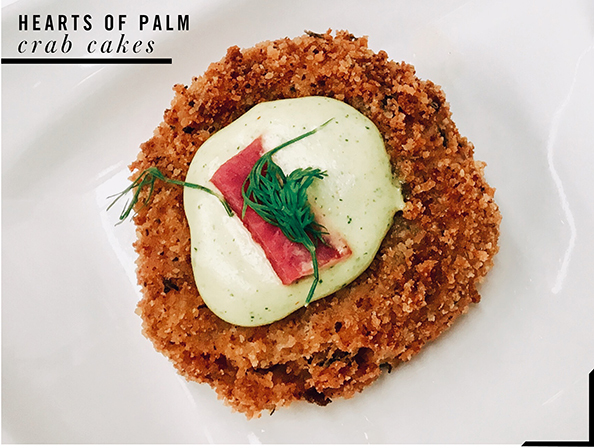 Make 3 ounce circle-shaped cakes, dip in the milk, then dip in the flour, then dip in the breadcrumbs until completely covered. Set aside. 8. Then submerge 3-4 patties at a time, and fry for 3 minutes until golden brown. 9. Let cool on unwaxed parchment paper for 2 minutes, then serve. For garnish, or to use as dip: Blend ½ cup dill, 1 clove garlic, 2 tablespoons nutritional yeast, and 2 cups mayo until smooth. 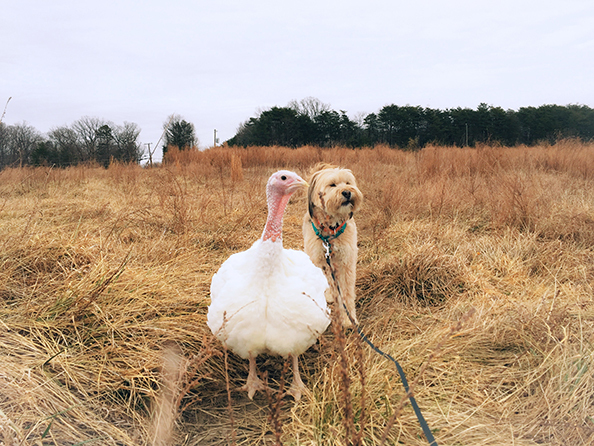 If you would like to get to know a turkey in real life, volunteer at your local sanctuary. We recommend signing up to clean a turkey barn! 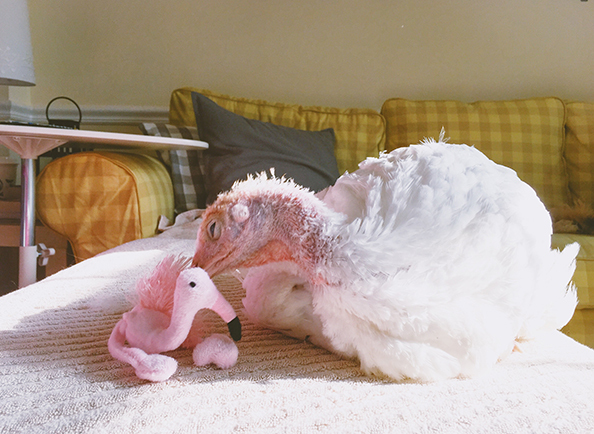 You can also sponsor a rescued turkey.